Kitchen islands have become so popular in new builds and kitchen remodels that you can hardly find a new kitchen without one. Why are islands on the “must have” list for so many homeowners? For starters, they are a multifunctional workhorse that can provide a cooking area, an eating zone, a prep space, an entertaining hub, or all of the above. They also provide an opportunity to make a unique design statement, whether with a contrasting cabinet or countertop color or decorative elements, like pendant lights. 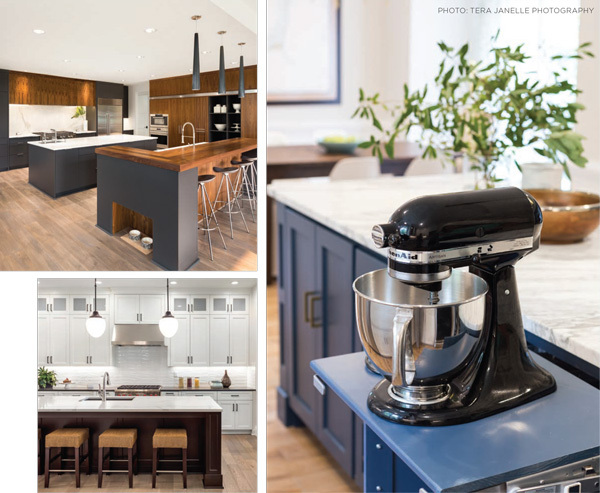 We talked with some of the area’s most popular kitchen designers and cabinet makers to find out the latest trends in kitchen islands, and give you some food for thought on your next kitchen project. Kitchen designs of the past often incorporated small prep islands, sometimes in conjunction with a peninsula area for bar seating. As styles have evolved, kitchen islands have grown larger and multi-functional, and peninsulas have largely disappeared. Dan DeNeal, of DeNeal Cabinets in Moneta, has built custom cabinets for area clients for more than 30 years, and says about 90 percent of the new kitchens he designs and constructs today have large islands. “The trend has also changed to a single height island, instead of bi-level,” says DeNeal. Sheri Howard of The Cabinet Gallery echoes these thoughts, and says the benefits of single-level islands include a continuous sight line, more prep space and a modern look. The larger the island, the more functionality it can contain. A popular layout is a large rectangular island that has a prep zone along one side, often including either a sink or cooktop. The other side of the island has bar seating for casual meals, with seating all facing in one direction. Because the island seating often negates a breakfast table, some islands are designed with a table area at one end, where chairs face one another for ease of conversation. With this set-up, the table area may be at a lower height than the rest of the island, or the material might be different, like a butcher block to contrast with the stone prep area. This type of bi-level island is different than the bi-levels of previous decades, when the island was divided in height horizontally, spanning the length. And when today’s islands are multi-level, new LED lighting technology allows for some stunning effects. “For a recent kitchen, we did under-cabinet lighting beneath the lip of the raised part, which highlighted the backsplash,” says Howard. A new trend in island design is to break up a large rectangle by creating two smaller islands of the same size, with room to walk between them—often a solution for better flow. One island can be for seating and the other for kitchen work, or seating can be at both, like small restaurant tables. In a very large kitchen, two large islands can fill in space nicely, while creating an entertainer’s dream layout. The island closest to the living area can contain buffet space and seating, while the island nearest the kitchen can function as the work zone. As islands have gotten larger and multi-functional, designers have come up with fun ways to make them work for modern families. Lee Ann Carter, of Carter’s Cabinet Shop, says, “All appliances can be put in the island, now that there are microwave drawers and refrigerator drawers—and dish dividers in drawers have eliminated the need for many upper cabinets.” Refrigerator drawers, separate from the main refrigerator area, can be covered in cabinet panels to disguise them, and are great for storing snacks that little hands can reach. They can be placed at the end of an island so people can grab a snack without interrupting the cook. Other popular island appliances include wine and beverage fridges, ovens, and cooktops. 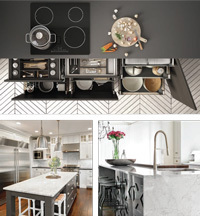 Recent kitchen trends include fewer upper cabinets, which are often replaced by open shelving. As Carter mentions, deep drawers designed for dish storage can make upper cabinets unnecessary, which means larger or additional windows can be installed in a kitchen. This is a plus, especially if the view is a treasured one. Large and heavy countertop appliances, like mixers and juicers, no longer have to occupy valuable real estate in the kitchen, because special cabinets with lifts that raise to counter level in the island can disguise these appliances until they are needed. Of course, these can be installed in perimeter cabinets as well, but if the island is the main cookie-baking zone, why not have the mixer where you need it most? Another ingenious island prep zone idea that Carter has used is a trash chute, sometimes called a “compost hole.” On a recent kitchen design, Carter cut a trash chute circle into the island’s butcher block counter, so that bits of food and other waste could be swept directly into a bin underneath. A fact of modern life at the lake and elsewhere is a collection of chargers and laptops, phones and tablets. Any island should have ample plugs in the seating zones for plugging in devices during use, but hidden charging zones can keep things clutterfree while devices are juicing up. Options include charging drawers or a charging cabinet, which can be placed at the end of the island. While the options for functionality have made islands a kitchen staple, they are also valued for the chance to make a big design statement in the kitchen. Many people prefer to use a contrasting color on the island—recent popular colors include navy blue, watery blue-greens, and shades of gray. 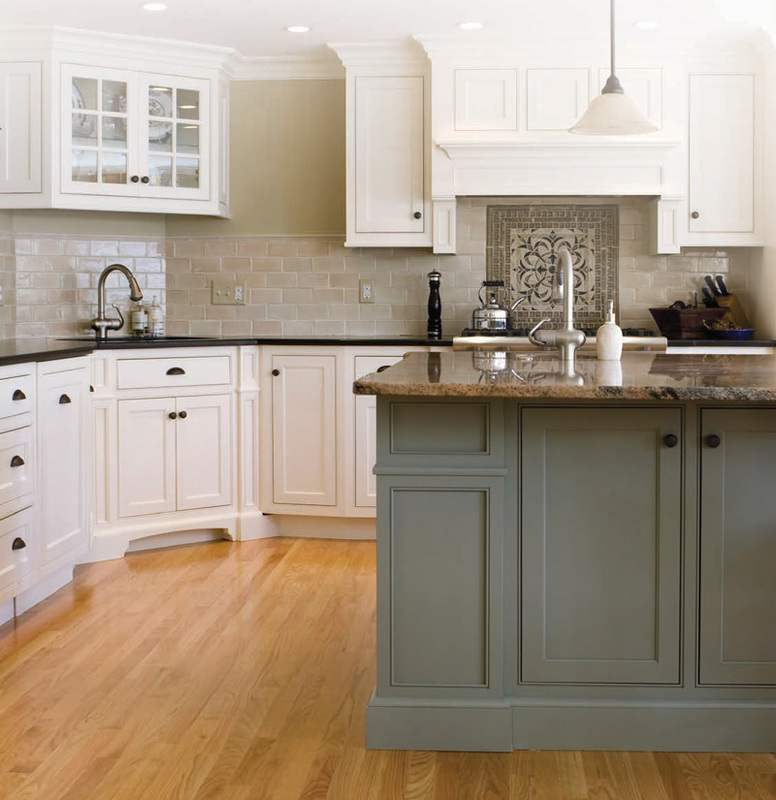 A popular look includes white or off-white perimeter cabinets contrasted with a color on the island cabinets. This opens up design possibilities, including echoing the island color in the kitchen backsplash or other accessories. Some homeowners opt for the same color cabinets throughout the kitchen, with a contrasting countertop on the island. Another possibility is the “tuxedo kitchen,” with darker base cabinets throughout (including the island) and white or light-colored upper cabinets. There are so many customization options that a kitchen can truly be a unique expression of the homeowner’s personal style. 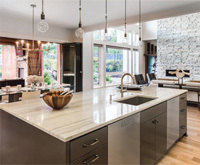 Homeowners will find no shortage of countertop options for the island, including granite (both polished and honed), soapstone, concrete, marble, wood and quartz, among others. Some surfaces require sealing and maintenance, while others are virtually indestructible. It’s worth considering how the island will function before committing to a countertop surface. For example, wood is beautiful and can be an inexpensive option, but if you’ve included a sink in the island, you might want to consider something waterproof. Have an island cooktop? Soapstone will allow you to place hot pots directly on the surface without harming it. Quartz comes in a variety of colors, and many are made to mimic natural stones like marble, but without the upkeep. Granite now comes in leathered and honed finishes, which are matte and provide a more modern look that many house hunters covet, so keep it in mind for resale purposes. Whatever material you choose, you’ll be seeing a lot of it on a large island, so pick your own slab when possible and consider the decision carefully. In addition to choosing a countertop material, you have some other options for customization, including the bold statement of a waterfall finish, in which the countertop material also covers the side of the island and goes all the way to the floor. It’s a great solution for high-traffic areas, where the ends of the island are likely to show wear and tear the fastest, while durable stone can be wiped year after year and won’t show its age. You can also opt to increase the thickness of the island countertop, which can add visual weight and presence—especially in a room with vaulted ceilings—and can distinguish the island nicely from the rest of the kitchen. A recent trend also includes dressing up the island cabinets with different materials, and designers at the lake are fielding these requests. “Sometimes we use reclaimed wood or shiplap on the back or side of the island, to offset it from the rest of the kitchen and accent the eating area,” says DeNeal. For big style oomph, pendants over the island are like icing on the cake—they can provide that finishing touch in the room. There are so many pendant styles to choose from that there is bound to be something to meet the needs and style of every designer and homeowner. One caveat—at the lake, views are a precious commodity. Be sure that pendants don’t disrupt sight lines. In those cases where pendants would be disruptive and clunky, recessed lighting is a better bet. 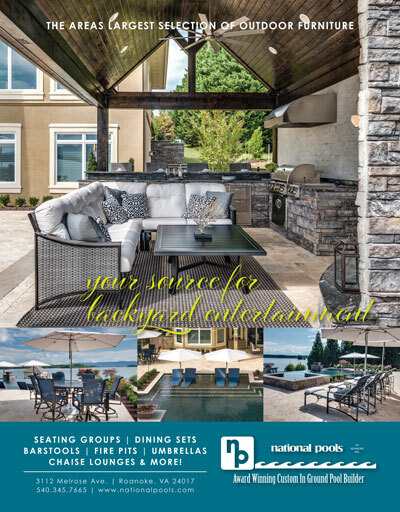 If you’re embarking on a kitchen renovation or building your lake house, designers say that kitchen islands are here to stay. Think about what functions and styles suit you and your family best so you can plan a kitchen you’ll enjoy for years. As it turns out, you can have an “island life” at the lake!